AgroAtlas - Crops - Poa pratensis L. - Kentucky bluegrass, smooth-stalked meadow grass or meadow grass. Poa pratensis L. - Kentucky bluegrass, smooth-stalked meadow grass or meadow grass. 2n=28, 35, 42, 46, 56, 63, 64, 70, 72, 74, 82, 84, 147. Perennial plant, medium size, usually hairless, rhizomatous. The root system is extensive and finely branched. In established stands, the mixture of roots and rhizomes concentrated in the upper 5 cm of soil form an extremely dense, resistant sod. Stems erect or ascendent, 30 - 100 cm high. Blade folded when young, long (up to 30 cm), rather narrow (1 - 5 mm), quite stiff, dark green to greyish green, with 2 visible veins on each side of the central nerve and with a hooded tip. Ligule of the lower leaves very short, truncate. Ligule of the upper leaves longer (1 - 3 mm), but always rather short and truncate. No auricles. Panicle-like inflorescence, spreading, oblong-pyramidal ( up to 25 cm long), with branches clustered per level of 2 to 5. Tendency to form 3 short branches and 3 long branches at each level, but this feature is very irregular. Spikelets 3 - 5 - flowered, with woolly hairs at the base. The weight of 1000 seeds is 0,25 to 0,30 g (small seeds). Flowering is early, taking place in May and June, seed ripening July-August. Apomictic species. Introduced into culture from the end of XVIII century. Cultivated on large squares in the forest, steppe and mountain areas at 37 regions and republics of former USSR countries. 5 breeding cultivars have the state permission for pasture and hay utilization; 30 breeding cultivars have the state permission for lawn utilization . Mesophyte. Large climate range. Very resistant to cold and heat. Very resistant to drought. Can be an interesting alternative to perennial ryegrass in grazed pastures in dry continental climates or on dry sands. Optimum on cool to dry soils. Marked preference for slightly dry soils, well drained (sand or shallow soils). Large range for nutrient availability. Can be abundant on soils moderately supplied to very rich in nutrients and on moderately acid to alcaline soils (mesotrophic to eutrophic species). Has however quite low requirements, can survive on rather poor soils. Preference for light, sandy soils but large range. 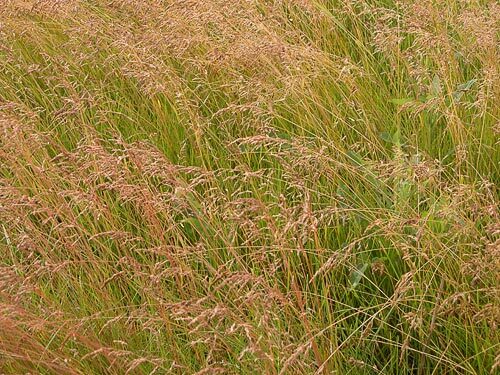 This grass ranks as one of the most palatable pasture grasses. Often used in mixtures with other forage crops especially with Lotus corniculatus and Vicia cracca. When it is kept actively growing by proper fertilization - and stays in the vegetative stage - the protein content remains high throughout the season, varying from 20 percent during spring growth to 10 percent upon maturity. Crude fiber is inversely proportional, with 15 percent in the spring and 25 percent at maturity. Kentucky bluegrass is seldom used for hay production. Forage mass productivity ranges from 6-12 MT/ha, hay productivity ranges 2,5-3,5 MT/ha and seed productivity is 150-200 kg/ha. Kentucky bluegrass is primarily used as a lawn grass.